Like many skilled trades, painters are in-demand. You can learn more about being a Painter through our detailed Career Profiles. 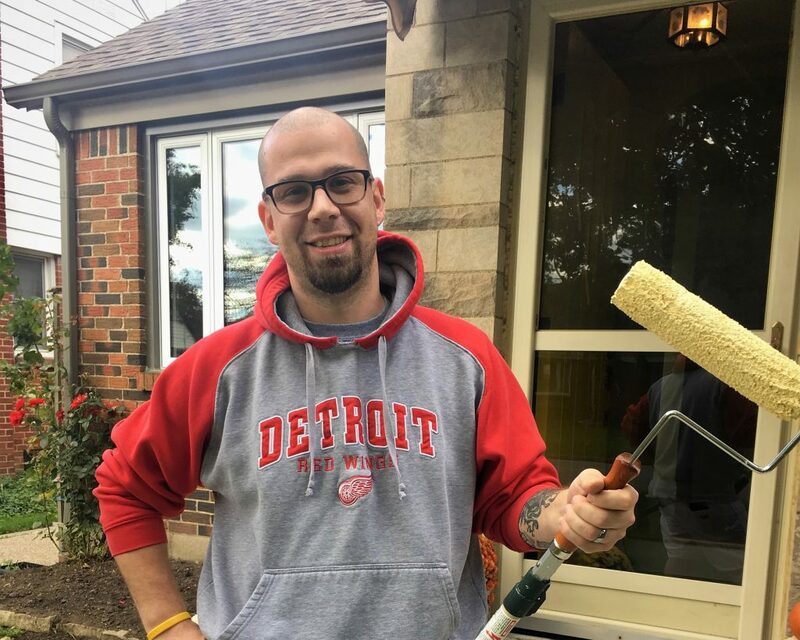 Drew has been a painter with the International Union of Painters and Allied Trades (IUPAT) for 10 years. 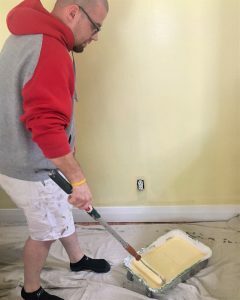 He is a Red Seal certified painter. His job is in-demand, and Drew himself is extremely in-demand. 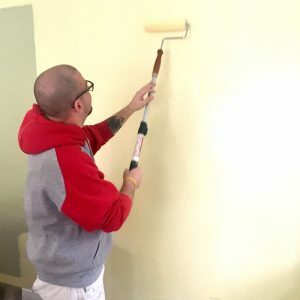 He works as an industrial painter with Manz Contracting Services Inc., and also does freelance residential painting. He works well and he works quickly. 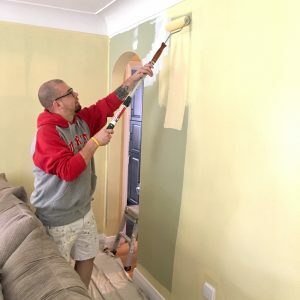 We know this because we met up to talk to Drew as he worked in a residential location; in the hour long interview, we learned about the details of his job, and he painted an entire room. 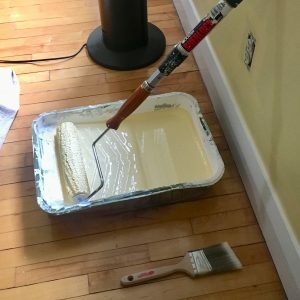 What is an average day for a painter? When I’m working in residential I like to start bright and early – normally between 7-8am. I get the supplies ready, make sure I have everything I need, and I access the job and cover furniture. To prep the surface being painted I patch walls, fill holes, sand the fills etc. Then painting begins. I do the walls, ceilings, floors, whatever needs to be done. I work in a lot of different locations and I’m around a lot of different people. Can you tell us about the schooling/training you had to be a painter? After high-school, I first started out painting by learning from my grandfather who had a painting business out West. Then I came back to Ontario, joined the Union (IUPAT) and went to the Ontario Industrial Finishing Skills Centre in Toronto. The schooling and apprenticeship process was three years. 6000 hrs total, 720 hrs of schooling and the rest was on the job training. Some of it was classroom talking about safety and procedure, but a lot was leaning from doing. The school had many facilities on site for training so we learned things like confined space rescue, how to run certain pumps or sprayers, how to use scissor lifts, sandblasting, was a lot of hands on stuff. Because I was in the union, the union hall found me my paid apprenticeship and I got to work. For every year working while in school I got a bit of a raise, and learned more skills. The union qualified me for grants, and I won a couple scholarships and awards throughout the course. At the end I wrote my Red Seal Trade Exam so I could work anywhere across Canada, get paid what I do, and get recognized for the quality of work I can put out. For me, painting is a stress reliever; and it allows me to be creative. You think a lot while you’re painting. I didn’t ever think I was going to be a painter, but painting just kind of came to me when I started to paint. It’s just something I really enjoy doing. Ever since I started, it was just like second nature. Good painters have the skills, are reliable and focus on detail, but I think to be really good at what you do you have to enjoy it. If you don’t enjoy it, you’re not going to put your all into it and nobody’s going to want to hire you. What advice do you have for future painters? Go through the right steps, give it your all, go through your apprenticeship, and write your Red Seal test. If you’re good at what you do, and you put in the effort, there’s lots of work for painters in the city. That’s a trend with most trades. If you go into it just for the money and you don’t want to be there you won’t make a career of it. If you work hard, and enjoy it, you’ll be great. What would you say are some of the challenges on the job? For industrial painting- you need to practice safety on the job. Every place in industrial has a slightly different safety procedure, paying attention to the people and machinery around you is extremely important. While you’re working, especially for residential, you need to be able to make sure to keep the place clean and organized. If the space is being occupied while you’re painting, you need to make sure that you work almost unnoticed. Make sure the work is done properly, neatly, and quickly. If you do this are you almost guaranteed to be called back if they need more work done in the future. Organization and proper job planning will ensure this happens every time. I like painting in the city because I get see the different parts of the city that I never could see before. Get to go into these old buildings and paint this stuff, and explore and see how things were done before. I’ve painted inside Hiram walkers, a lot of the old schools, on the bridge all the time, inside Chrysler and Ford. I like the history of Windsor so being able to see all this stuff definitely intrigues me. Thank you to Drew for taking the time to talk to us. To learn more about people who work in-demand jobs in Windsor Essex, please click HERE.